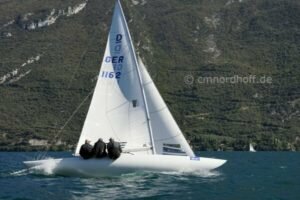 GER 1162 Stephan Link, Michi Lip & Frank Butzmann dominate in Torbole'. 4th-6th Oct.
7 races sailed in sunshine and 15kts over 3 days on the picturesque water's of Lake Garda, saw 3 sailors stand out amongst the 41 teams competing for the Hans-Detmar Wagner Cup. Yes, the 2017 Gold Cup winners, Stephan Link, Michi Lip & Frank Butzmann started with 1st, 1st & 2nd on the opening day and never looked back, only to see their opposition :-). Following a fantastic opening day this experienced lake sailing team recorded a 6th, 2nd & 2nd which allowed them the luxury of not needing to sail the final race, which is always a huge relief at any event, particularly of this quality. So very well done to the GER 1162 "Desert Holly" team. 2nd Overall GBR 820 Jimmy Williamson, Grant Gordon, Ruairidh Scott & Sophie Weguelin. The final podium place went to GBR 819 "Fever" helmed by Klaus Diederichs crewed by Jamie Lea and Gustavo Lima who replaced Diego Negri this time, while Diego competes at the Star Worlds. Klaus told me "It was great organisation both on and off the water. Stephan sailed a perfect regatta and did not put a foot wrong. Also Philip Dohse was very strong and finished top Corinthian. Although one boat lost its mast on the last day, its a great venue with many classes hosting their Worlds here". Well sailed the Fever Team, good luck in Perth. PRO Carmelo Paroli with 3rd Overall Gustavo Lima, Klaus Diederichs & Jamie Lea. As Klaus mentioned, the top Corinthian Team were GER 1151 Puck IV helmed by Philip Dohse who finished just 4pts off a podium position and once again in a great position of 4th overall. A fantastic result from this Husband & Wife team. Top Corinthians, GER 1151 Nicola Dohse, Volker Kramer, Christian Moeller & helm Philip Dohse. So another first class regatta with over 40 boats and a full program of races sailed. As usual there were winners and losers but everyone enjoyed the fantastic sailing Lake Garda offers, year in year out. I spoke with top Professional Lars Hendriksen who for once, did not have a good regatta on board NED 412, he explained " When we went left, right was right. When we went right, left was right and right was wrong :-). Same thing on the downwind legs, seems like we get everything wrong here. Any attack on the fleet is punished, so it was best to follow the leader and be a good boy". But as Lars told me, that is not his style ! :-)..